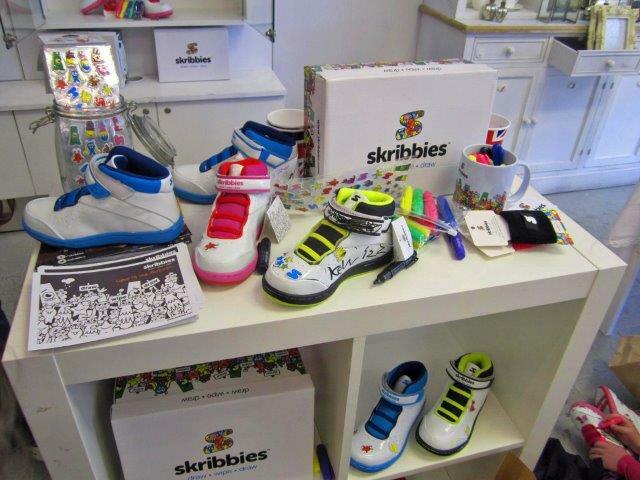 Pop Up Kings Road with Skribbies shoes! 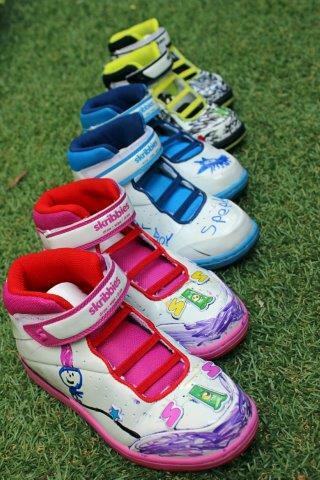 Skribbies are footwear that can be drawn on, wiped clean and then drawn on again. I was intrigued by the idea but wondered how they would work in reality. For the first two weeks of August, 387 Kings Road, London has opened it’s doors as part of Pop Up Britain. For a limited time you can purchase products from some of the most exciting online brands in a physical store. I popped along to the launch event to meet the Skribbies team. 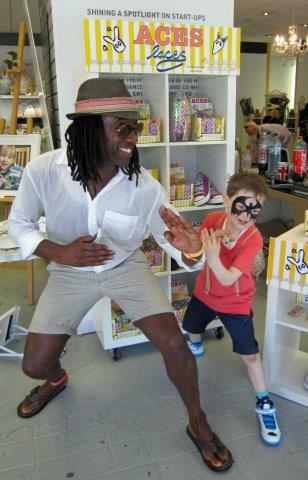 A few recognisable faces were also in attendance such as CBeebies’ Sid Sloane, much to the kids delight! The store itself is situated quite a long way down the Kings Road, but it’s definitely worth a visit. There are eight temporary residents selling a range of goods suitable for kids, mums-to-be and the home. 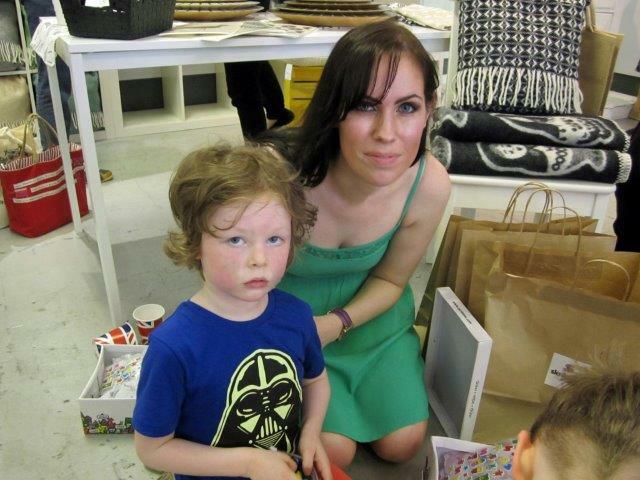 There are also craft activities and face painting to keep little ones occupied while you browse. My son insisted on having his face painted as Batman before posing with Sid at the front of the store. It was great to see the shoes in real life and have a chance to test them out. 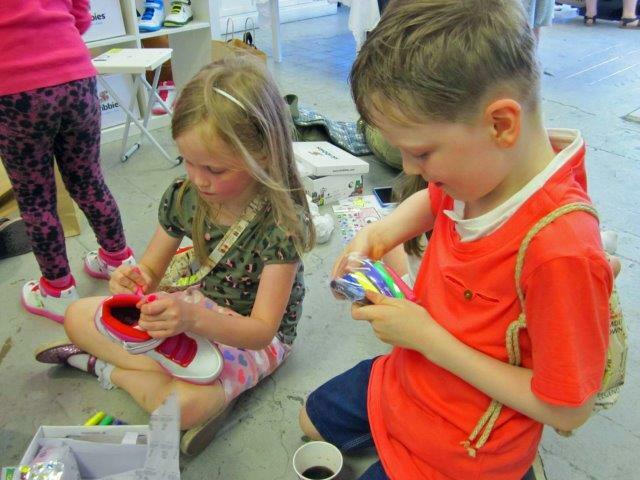 Will kids actually enjoy drawing on their shoes? The kids ran straight past the craft and face painting tables to sit on the floor and start doodling. 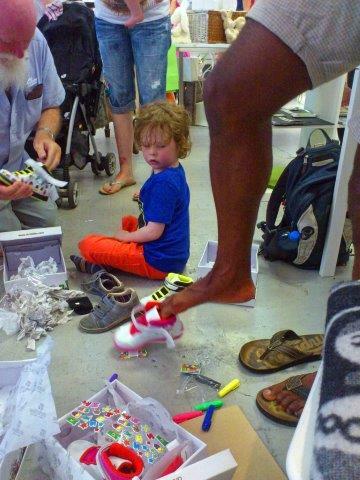 They drew several designs while we were there and have continued to enjoy changing their shoes daily. 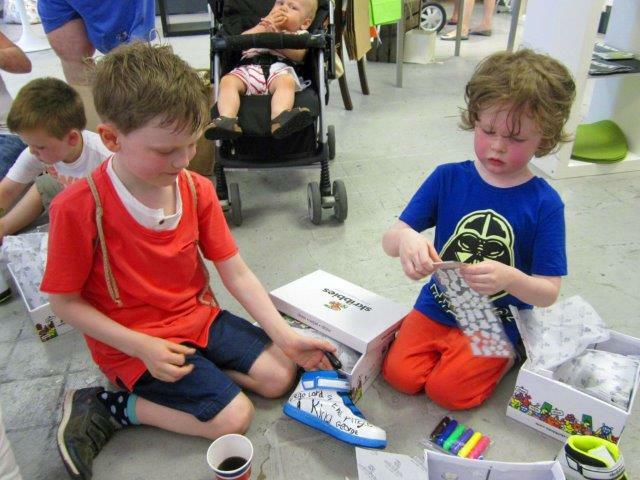 Even Sid got in on the colouring action, unfortunately as Skribbies are only available in Junior sizes 10 – Adult size 3 so they were never going to fit him! I can confidently say that kids (and adults!) really enjoying drawing on their shoes. 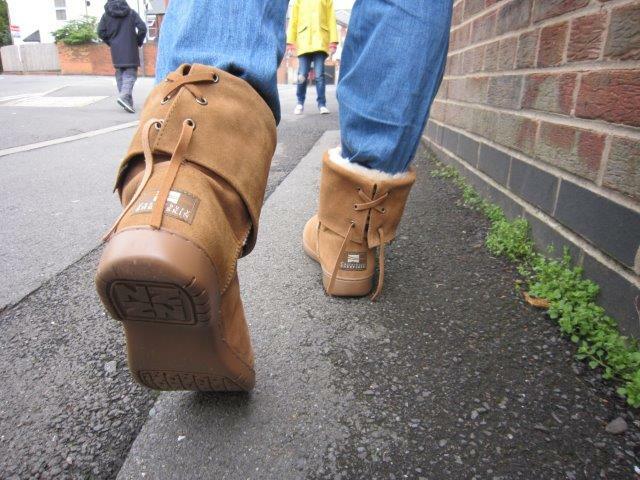 Will the designs last when walking about or in the rain? All three children wore their shoes from the pop up store over to the Natural History Museum, then on several tubes and walking around London. As long as the design has dried they seem to last. I haven’t tested them out in the rain yet, but I am told they will survive as long as they have been given time to dry before venturing out. 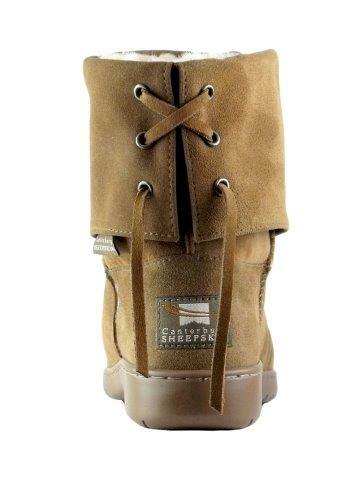 We haven’t had them long but considering all my children are very hard on their shoes and we had several trips and stubs in London I’m amazed they are still in one piece already. Only time will tell, but so far it’s a thumbs up! I do. 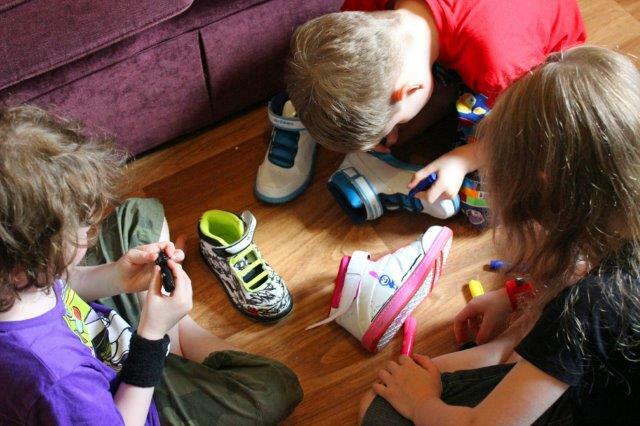 They hold a magical appeal that keeps my children quiet and occupied for long stretches at a time! 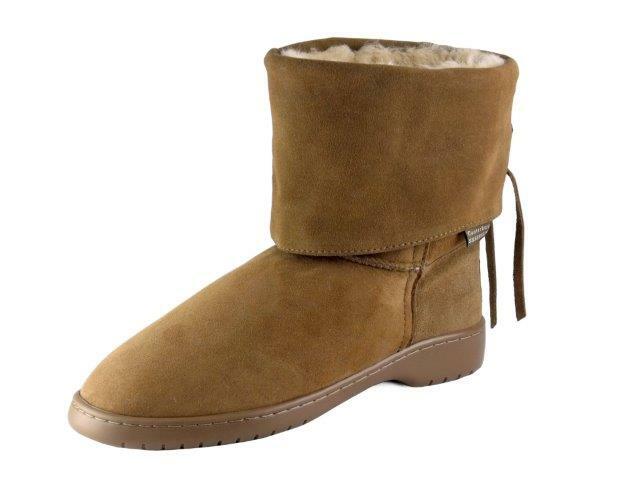 My youngest is also notoriously fussy when it comes to his footwear and he loves these shoes. Plus the fact that they have Neon accents makes the kids easier to spot should they wander a bit further away from you than you would like. 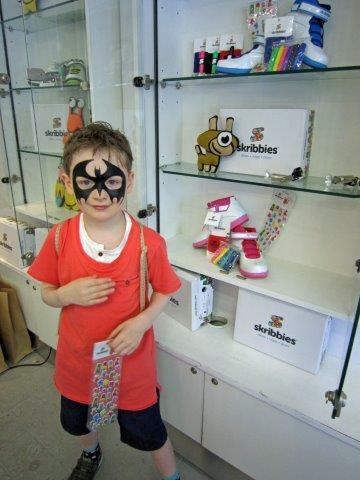 We all had a fabulous time meeting the Skribbies team and trying out the new shoes. I can honestly see these becoming a must have accessory for cool kids and parents will enjoy the peace they seem to bring. I would definitely recommend visiting the store to see the shoes in person and meet the team if you can. 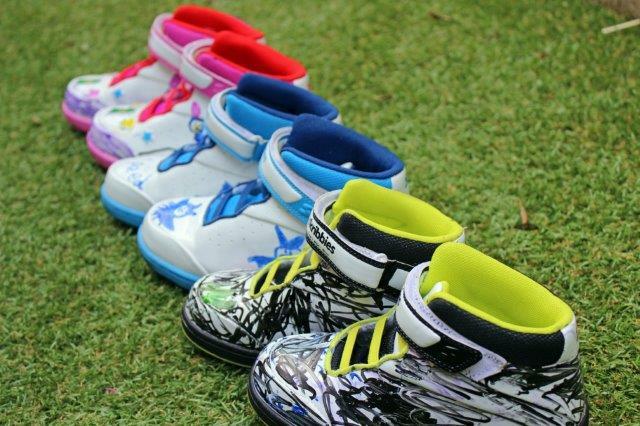 Skribbies are available in three colour variations; pink/red, neon yellow/black and blue/navy. Each pair of Skribbies comes with a pack of magic pens, a wristband to wipe the designs off and stickers to further customise. Further colours and designs and planned for the future including low-top trainers. They are priced at £35.95 and available to purchase online from www.skribbies.com or in person from the Kings Road Pop Up Store.